​This park contains one of the world’s best collections of cliff dwellings. It is one of the most popular attractions in the Southwest and is unique because it preserves the beauty of nature and the works of early man. Previously referred to as the Anasazi, the Ancestral Pueloan’s thrived in the region from 600 to 1300 A.D. They then disappeared leaving behind fascinating historical relics. ​Is west of Mancos towards the Colorado-Utah border. The ruins at Hovenweep are over 700 years old. Be sure to check with a ranger about visiting the outlying ruins. There are two routes to Hovenweep, South through the red rock beauty of McElmo cayon or north on Hwy 666 to Pleasant View. The lower ruin, west of Pleasant View, known for its great kiva and painted wall, is a fascination bonus on this trip into the past. ​Offers a personal experience for the visitor in the ruins just South of Mesa Verde. All tours are hosted by the Ute Indian guides who will interpret the archaeology of the Park and the history of the Utes as you take this trip back in time. The mystical feeling of this tour allows you to feel as if you are amongst the first to walk on the ancient pathways. Reservations are necessary. Call 1-800-548-5485 x 282. ​This day trip odyssey begins with the Canyon of the Ancients Visitor Center and Museum, (970)882-5600 or rene_farias@blm.gov ) the southwest’s state-of-the-art museum. It is a large research and artifact storage facility for the study and interpretation of the Anasazi culture. This is a “must see” for Mesa Verde country visitors. Continuing west on Hwy 484, turn North on Hwy 491 to the South edge of Dove Creek, then East to the Dolores Canyon Overlook, eleven miles to the Northeast. The spectacular views of the winding Dolores River Canyon and the mountain ranges of Southwest Colorado and Southeast Utah surprise the visitor with their beauty. This is the Grand Canyon of Colorado! It is a 1/2 mile deep, red-walled canyon with the Dolores River far below, winding its way north to the Colorado River. ​Rico, Dunton, The Meadows- the headwaters of the Dolores River are high in the San Juan Mountains near Lizard Head Pass. This is a lazy day trip which takes the visitor through Dunton, a turn of the century gold-mining town. You pass through the meadows and tall Aspens to meet Highway 145 above Rico. This trip puts on a great fall show. ​McPhee, the second largest body of water in Colorado, offers all the pleasures of excellent fishing, boating, water skiing, camping, hiking and relaxing. There are fisherman access points, boat ramps, picnic and camping and recreation areas all around the lake. McPhee is just a few minutes from Mancos and offers a quick getaway anytime of the day. What a wonderful way to experience a Colorado sunset. The lake overlook offers you a 360 panorama of four states and several mountain ranges. Nestled deep in the San Juan Mountains, is a leisurely hour and a half from Mancos on Hwy 145 via Hwy 184. Telluride offers a wonderful day’s worth of history and adventure for the whole family. Telluride is a National Historic District located in a box canyon surrounded by towering peaks. Butch Cassidy robbed his first bank there, but there’s more than history; Telluride hosts music, art, film, food, balloon, hang gliding and even mushroom, and photography events and festivals over the course of each summer. Nature puts on her own show during the colorful Fall Festivals hosted in this spectacular mountain town. This 236 mile loop takes you through the heart of the San Juan Mountains through old mining towns and back to Mesa Verde Country. From Mancos, you can take the loop either way, passing through Durango, Silverton, Ouray, Ridgeway, Telluride, Ophir, Rico, Dolores and Cortez. This is an excellent way to capture the grandeur of Southwest Colorado. Drive West into John Wayne country and visit the majestic and mysterious rock formations that form the Valley of the Navajo. The geology is fascination and will make your trip even more interesting. A film crew in the valley is still a common sight. There are two routes to the valley; both have exciting trips to them. Four Corners Monument, the only place in the United States where four states meet, is a “must stop” to take pictures of each other while standing in four states. Canyonlands is a magical collection of sinuous red rock canyons dissected by intermittent stream beds and washes. It’s a great place to explore, whether hiking, backpacking, mounting biking or by jeep. You’ll find ancient ruins, natural arches and breath-taking vistas. In the Spring or Fall, Canyonlands is even more breath-taking with the changing of seasons. There are two entrances to Canyonlands; the first at Newspaper Rock (an ancient message board), the second North of Moab at the awe inspiring Island in the Sky area. Arches has the largest concentration of natural arches in the world. Over 1000 natural arches have been mapped in this park just North of Moab, Utah. Many formations of red rock sandstone are visible from the 21 mile paved road. Don’t cheat yourself though; the hiking in Arches is worth the time for the incredible views. An informative Visitor Center, which is open all year, introduces you to the Park and it’s terrain. 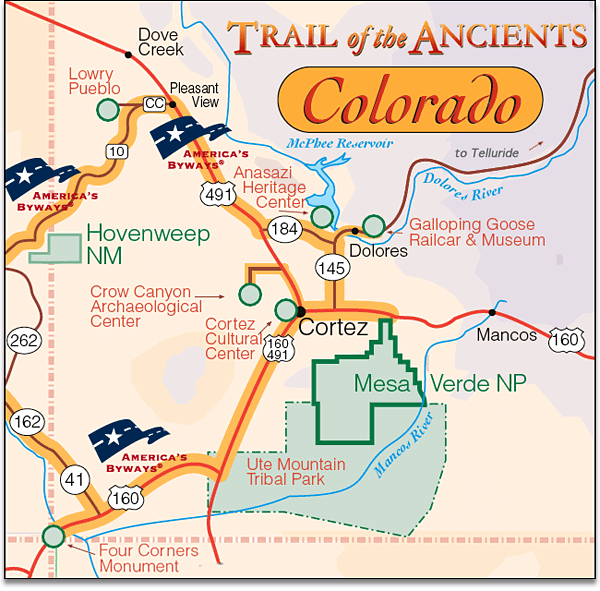 This loop drive takes you into Northwest new Mexico to explore the ruins at Aztec national Monument in Aztec, NM and the Salmon Ruins near Farmington, NM. On the return journey, you can relax at Navajo Lake which straddles the Colorado/New Mexico border on the Southern Ute Reservation. Further North on Hwy 151, you’ll find Chimney Rock archaeological ruins. Take a ride through the majestic mountains of Southwest Colorado for an experience of a lifetime. Named number one North American train ride by National Geographic! Located at 479 Main Avenue, Durango, CO 81301. 970-259-0274.